REDDING, Calif. - Simpson University will hold its annual athletics fundraising golf tournament at The Golf Club Tierra Oaks on Friday, April 25. Registration is $100 per person before April 20 and includes breakfast and a BBQ lunch, 18 holes of golf (including a cart), range balls, and a goodie bag. Registration is limited to the first 100 golfers. 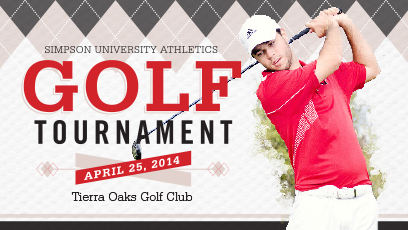 Sign up online at simpsonu.edu/golftournament or by calling (530) 226-4703.